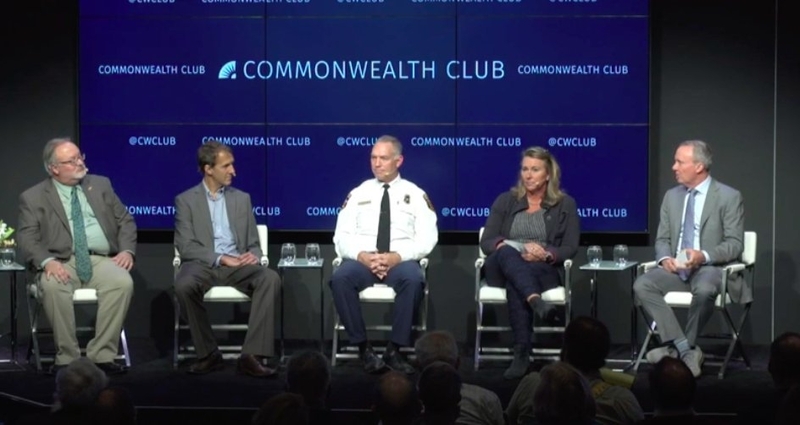 Keith Gilless, left, and Maggi Kelly, second from right, discussed wildfire at the Commonwealth Club on Dec. 4. …In other words, "a source [of heat] hits receptive fuel that's dry enough to burn," said Lenya Quinn-Davidson, a fire analyst for the University of California Cooperative Extension forestry program in Northern California. In the right conditions, those three factors are all it takes to set a wildfire in motion. …However, ignition is only the beginning. For a spark to grow into a sustained wildfire, there must be a perfect combination of factors, such as "dry conditions and really strong winds," Quinn-Davidson told Live Science. And because of climate change, dry conditions are lasting longer and, in turn, causing longer fire seasons. …It costs about $400 per acre to reforest land, said Bill Stewart, a forestry specialist at UC Berkeley who has studied forest restoration programs after fires. …Max Moritz, a wildfire specialist at the University of California Cooperative Extension, said wholesale clearing is not always necessary. The rush to clear the land, he said, can result in healthy trees being cut down. Rachael Long, a University of California Cooperative Extension entomologist and crop adviser, recently told me a story about three wasps that people frequently encounter around their homes and often have misconceptions about. …Alison Van Eenennaam, animal geneticist, University of California-Davis, says edits that create polled herds will soon be common. Gene-edited farm animals are coming. Will we eat them? ...“Right now. This is exciting, right this minute,” animal geneticist Alison Van Eenennaam said as she waited for a tiny blob of a fetus to materialize on a laptop screen on a recent afternoon at the Beef Barn, part of the University of California at Davis's sprawling agricultural facilities for teaching and research. …But often, even 10 feet from a house takes one into a neighbor's property. Whether this means mandating more aggressive tree and brush clearing, and reevaluation of building codes for new and existing structures, is something the new council should consider, availing themselves with input from our local fire department but also from people like Jack Cohen. Another wildfire expert, Max Moritz, suggests that governments must be more aggressive in not allowing development in areas especially vulnerable to wildfire. …"What's fascinating about the Farm Bill is, after all that hyper-partisan debate … it's really a lot of the same of what we already had," said Glenda Humiston, vice president of University of California Agriculture and Natural Resources. Humiston is pleased that California will get an increase of $25 million a year for research of specialty crops, agricultural jargon for fruits, vegetables and nuts, as opposed to commodity crops like soybeans, corn and wheat. Those federal grants will cover many areas, from adapting farming to the effects of climate change to finding cures for California's many invasive pests, Humiston said. Can California Improve Forest Management And Prevent Wildfires Without Going Broke? ...But can California expand programs like forest-thinning and controlled burns and manage its forests on the cheap? UC Berkeley forestry specialist Bill Stewart says yes. “There's certain areas that it is going to cost you $700 an acre, but other acres you can treat for $50 or $100 an acre,” Stewart said. “I'm passionate about genetics and sticking up for technology because if we don't stand up for it, we're not going to have access to it,” said Alison Van Eenennaam, Cooperative Extension specialist in the Department of Animal Science at University of California, Davis. “The livestock industry doesn't have access to GMOs because of the debate around plant GMOs,” Van Eenennaam said during a presentation at the 2018 American Agri-Women Convention. The University of California citrus research center swings open its doors this week to give farmers and the public the opportunity to view and taste more than 100 varieties of citrus. …Sheep owners, particularly those with small flocks, have had trouble finding shearers for years—and the smaller their flock, the harder it is to get someone to shear for them because shearers are paid by the number of animals they shear, said John Harper, a UC livestock and natural resources advisor who has run the annual shearing program for nearly 25 years. Could legalizing cannabis help the environment? Using high resolution satellite imagery for the years 2012 and 2016, Van Butsic from the University of California, Berkeley and his colleagues found a boom in cultivation of cannabis in Mendocino and Humboldt Counties. By zooming right in, the researchers could identify the distinctive shape of the cannabis plants, the regular pattern in which the crop is planted, and the greenhouses perched in unusual places. ...“The chances of environmental damage are much greater in these regions because of the high potential for erosion, which threatens water quality, high potential for using water directly from headwaters, and the need to build roads to access these farms,” says Butsic. ...Earlier this year, University of California system forest advisor Yana Valachovic toured the Carr Fire burn area in Redding. Susie Kocher, a forest adviser for the Lake Tahoe region with the UC Cooperative Extension, often works with homeowners that live within the Angora Fire burn area. That blaze destroyed about 250 homes in Lake Tahoe in 2008. A decade later, Kocher said people still aren't properly preparing their homes. …"Well, my colleague Katharine Hayhoe says climate change is like gravity," says Dr. Faith Kearns. "Climate change doesn't really care if you believe in it or not. It's reality. We have gravity, we have climate change." Are Your Bananas at Risk? ...Here in the US, there's only one kind of banana in the supermarket – sweet, yellow, no seeds, about as long as your hand. It's a variety called Cavendish and it dominates the international banana market. Which turns out to be a big problem. Jeff Mitchell is a Cropping Systems Specialist at UC Davis, based at the Kearney Agricultural Research and Extension Center in Parlier. He has devoted his 19 years to improving nitrogen and water use efficiencies in food, feed, fuel and fiber in no-till cropping systems. The Solano County 4-H Youth Development Program will host a 4-H open house from 5:30 to 8:30 p.m. Wednesday on the first floor of the University of California Cooperative Extension Office, 501 Texas St.
…The California State Fair is proud to announce the head judge for the 2019 competition, Mr. Paul Vossen. Vossen will employ his expertise and experience at the California State Fair olive oil judging to lead the team of 15 Judges and ensure a fair and ethical judging process. With more than 30 years of experience in the field as a University of California Cooperative Extension Farm Advisor in Sonoma County, Paul Vossen offers practical advice to large commercial ventures and hobby farmers alike for clients around the world. The inaugural California Dairy Sustainability Summit in Sacramento last month was a big hit. Conference presentations not only focused on what California dairy producers can do to increase their sustainability efforts, but also on how producers can better share their stories and correct some of the common misconceptions that have been circulating the public. Check out this video with Frank Mitloehner, Air Quality Specialist from the Department of Animal Science at UC Davis, who shared the facts, and read more about it in California Dairy Magazine. A forestry advisor for the University of California is a big proponent of cutting down Christmas trees on public land as an inexpensive, family-friendly holiday ritual and a way to thin the forests of excessive small trees. Susie Kocher, who works for the UC Cooperative Extension, has been trekking to the U.S. Forest Service land for the last two decades -- saw and $10 permit in hand -- to cut down her own white fir. Soil health and research on using cover crops were discussed by farmers, researchers and others at the University of California Cooperative Extension's Soil Health and Cover Crop Field Day on Thursday morning. Dozens gathered for a presentation on the Healthy Soils Project, which the local UCCE is participating in. The project focuses on managing soil health, changes in soil carbon and reducing greenhouse gases. …Amber Vinchesi and Sarah Light, agronomy adviser for UCCE Sutter-Yuba, gave a demonstration on how they would test for greenhouse gasses during the course of the project. In a patch of forest a few miles from Lake Tahoe's shore, Susie Kocher and her family are crunching through the snow to find a Christmas tree. …"It's a great win-win solution,” said Kocher, who is also a forest advisor for the University of California Cooperative Extension for the Lake Tahoe area. “You get the public out in the forest, you do good work reducing the density of the trees." ..So far, tree nut damages or other agricultural losses in the deadly Camp Fire are unknown according to UCANR Sustainable Orchard Farm Advisor Luke Milliron in Butte County. Even those with the greenest thumbs may need some guidance when it comes to pruning trees. The University of California Cooperative Extension office is here to help again with its annual fruit tree pruning demonstrations on Dec. 12 and 13. Starting at noon both days in the orchard of the cooperative's office, ag adviser Mohammad Yaghmour will show attendees how to trim back trees including apple, apricot, cherry and almond as well as grapevines. … To address some of these critical and urgent questions, please join The Commonwealth Club for a special free town hall on California's fires and what can be done in the short and long term to prepare for them. UC CalFresh Nutrition Education Specialist Elizabeth Lopez shares food safety tips and tools in this PBS episode starting at the 18:32 mark. …What these building codes and other rules don't take into account is whether a particular project should be built at all, said Max Moritz, a cooperative extension specialist in wildfire at the Bren School at UC Santa Barbara. “There's all these hazards that we use to guide our building and our zoning from floods to landslides, and fire is not one of them,” Moritz said. California is managing its forests — but is the president managing its federal lands? ...Scott Stephens, a University of California, Berkeley professor of fire science, said the fire cataclysms of the last two years seem to have ended a long era of inattention.